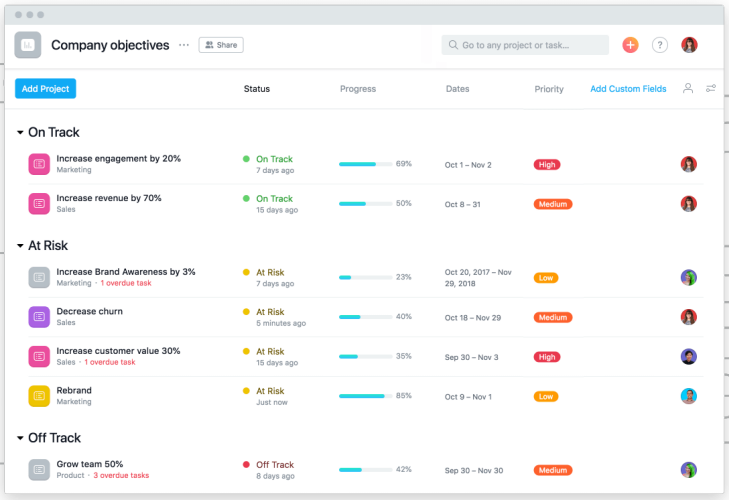 Portfolios is a set of new capabilities in the Asana Business plan that enables users to monitor everything they need to track in their business. It allows them to set their team’s priorities, monitor progress in real-time, and keep the rest updated. All these are available in a new set of views. From getting the big picture, to managing all the moving parts, they are able to clearly see their objectives, the plans to achieve them, and the individual member responsible for each task. 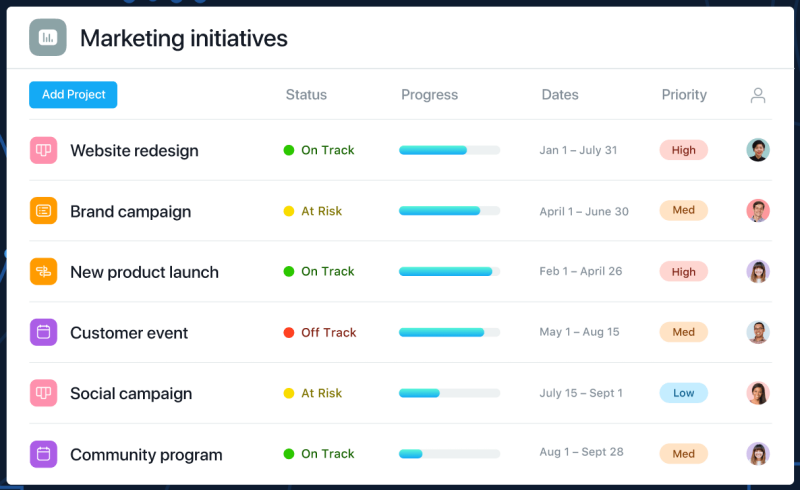 Asana Portfolios allows users to monitor the progress of company initiatives and objectives in one place. It is a high-level view that is founded on tasks and projects. Thus, they can drill down whenever they want to, and see who the team member responsible for a task is, its due date, and how it is connected and related to bigger company goals. Executive teams are creating goals and making critical decisions all the time regarding the direction of their company. However, it is the individual staff that are actually working on tasks. It is downright dangerous to create important initiatives without having a way to track its status. Portfolios provides senior management a way to monitor progress towards the objectives they set in real-time. They are able to keep work on track and achieve their goals with greater certainty. When users have real-time visibility on how their team’s work is progressing, they are able to see early any issue and make adjustments and corrections. Therefore, they are able to spot and rectify any problem before it can cause delays or any other negative impact. Doing this with separate disconnected tools is not only time-consuming but also most of the time ineffective. Instead, Portfolios provide this insightful view at any given time. For instance, a user at AB-inBev was able to track 70 craft breweries across the US. A heat map allows her to focus attention where its needed. She then sorts projects by status, and drill into particular projects that are going off-track. Asana Portfolios eliminate the need for manual searching, tracking, and piecing together of status updates. The automation and real-time information processing give users more time to do their job, analyze, and make timely decisions. They can go through their different initiatives during a weekly meeting, or share the portfolio with company leadership, all from the application. It will provide essential data that shows how work is progressing, what needs more attention, and any changes made and results in real-time. Tracking company objectives and keeping the entire organization updated – Users can add projects to work that is already happening. They can add custom fields for department responsible and project priority. Coordinating and collaborating on product launches – Each team may be working on their own project. But the success of the launch involves everyone completing their part at the right time. 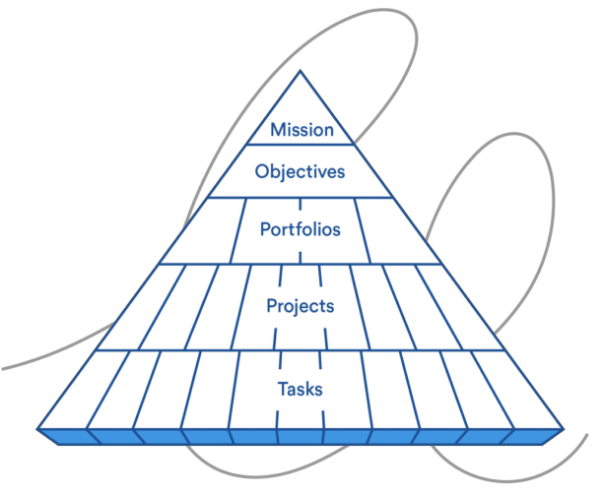 Keeping the team updated and focused – Project managers and team leaders can create a portfolio of their priority projects. During meetings, they can go to this portfolio to update or review which projects are on track, which are getting behind, and which ones need urgent adjustment. 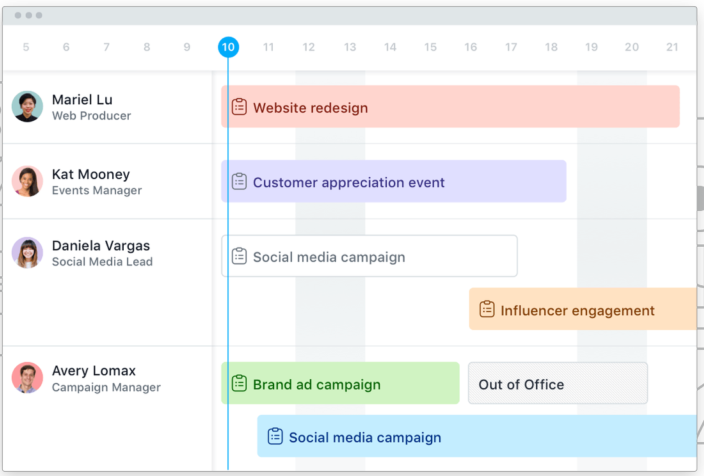 Part of the future vision is also the ability to manage the team’s workload right inside Asana. They are putting the focus on people in their resource management implementation. In effect, users will be able to plan and optimize the team’s schedule and capacity. This ensures that the right people are working on the right projects. The new Workload will consider what work is already being done. It will recognize a team member’s skill and schedule, so the software can easily and accurately reallocate resources when plans change. 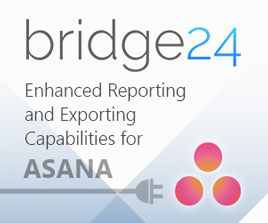 The Portfolios feature is available in Asana Business. It is a new plan in addition to the free, Premium, and Enterprise plans. Users will pay $19.99 per month billed annually. It targets teams and companies that need to manage work across initiatives. Some Premium members find it a bit pricey to get the upgrade. However, the Asana team is ready to find a solution that can make this new plan work out for their companies. For more information on new features, plans, and other product updates, follow them also on their Facebook, Twitter, LinkedIn, or YouTube page.